Elections 2018: What Happens If Republicans Lose The House? Keeping control of the House would validate President Trump's governing style and mean full speed ahead for his agenda. But if the GOP loses its majority it will need to protect Trump. 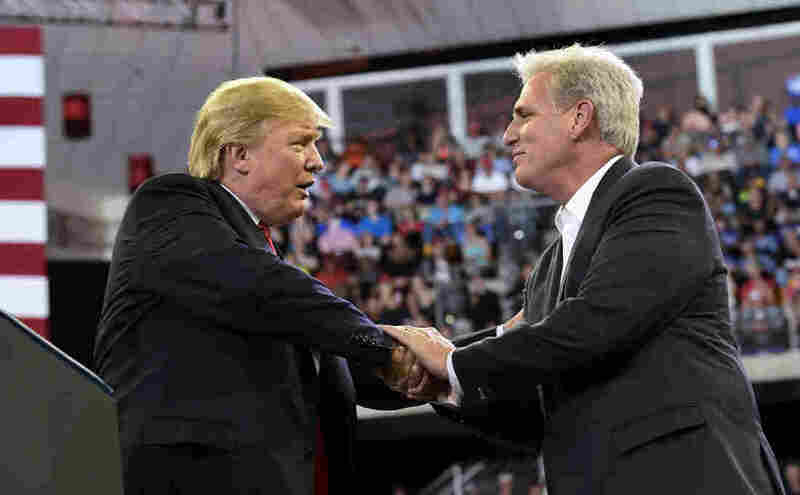 President Trump shakes hands with House Majority Leader Kevin McCarthy during a rally this summer. If Republicans keep their majority, McCarthy could be the next speaker of the House. Keeping control of the House would validate President Trump's governing style and mean full speed ahead for Hill Republicans to move his agenda. But if the GOP loses its majority it will need to to go on defense to protect Trump. When the Democrats lost the House in 2010, they rapidly saw President Barack Obama's legislative agenda die. Former Republican Majority Leader Eric Cantor says that's what Republicans can expect if they fail to maintain their majority. "Look, it's no fun to be in perpetual minority, I can tell you that," he says. "And especially in the House where a simple majority gives you almost absolute power to again set the agenda and get bills across the floor." Cantor says he thinks more Republicans will head for the exits if they lose. But Karl Rove, former top adviser to President George W. Bush, has a different prediction about how Republicans will react if they lose the House. "I think they will be both miserable and emboldened," says Rove. "They'll be miserable because they're in the minority. They will be emboldened because if the Democrats take it by a narrow margin, there will be deep divisions within the Democratic Party." Republicans will do their best to exacerbate those divisions. But one factor that could complicate things for GOP leaders is that most rank-and-file lawmakers have never served in the minority and are likely to be frustrated at how little they can do to stop bills through committees or on the House floor. They will instead be forced into a new role that is primarily messaging instead of legislating. What if Republicans keep the House? If Republicans hang on to their majorities in the House and Senate after two years of protests and marches against the Trump administration, it would be a crushing blow to Democrats. President Trump and congressional GOP leaders will see holding the House as validation of their approach to governing. Senate Republicans can continue to confirm judges at record rates. And both chambers could take another swing at repealing the Affordable Care Act and possibly help Trump shut down the Mueller investigation. Lawmakers also plan to enact additional tax cuts aimed at the middle class and work to promote new trade policies. Senate Majority Leader Mitch McConnell, R-Ky., and other GOP leaders have also been blaming Social Security and Medicare as sources of the ballooning deficit, suggesting cuts and other reforms could be coming if they hold control. But even if Republicans keep the House, their margins are likely to be smaller, making it harder to pass bills. Louisiana Rep. Steve Scalise, the No. 3 House Republican leader, told NPR that fewer GOP members overall means "you don't have as many people that can just be free agents." He noted that some GOP members who faced blowback from constituents on some key agenda items opted to "vote no but hope that the bill passes." There won't be much room for error on controversial bills, but keeping the Republican conference all on the same page could be a big task for leaders. "So ultimately, if we're going to have a smaller team I think we're going to have a more united team," he says. "Because at that point we're all in it together or it's not going to happen." Most Republicans admit the best-case scenario is keeping the losses to a minimum. At the core, the goal they're pitching in the final stretch of the campaign is two more years of moving Trump's agenda and a focus on creating more jobs. "We need to keep building on the success we have with the economy. You know we're just starting to bring manufacturing jobs back to America. We need to get better trade deals with our friends around the world. I don't want tariffs. I want a free trade environment where we actually can not only have good relationships tradewise with our friends but stand up to China," Scalise said. Trump, without control of Congress, could decide to triangulate. He is already talking about making deals with Democrats on infrastructure, something that could leave Republicans on the sidelines. Not to mention he has never hesitated to throw an ally under the bus, says Doug Heye, the former communications director for the RNC. "It could be bad for Republicans if he tries to do that," says Heye. "But it could be good for Trump — for his own personal political goals." Heye says the challenge for a lot of Republicans is that what's good for GOP lawmakers on Capitol Hill and what's good for the president aren't necessarily the same thing. Something else will happen if Republicans lose big on Tuesday: Their ranks in Congress will get smaller — but also white, older, more male and much more conservative. In other words it will more closely match the Trumpian base of the party. Former House Speaker Newt Gingrich says even if the Republicans lose and privately blame Trump for their loss, they'll have no choice but to stand by him. "The Republican Party, first of all, is going to be the Trump party," Gingrich says. "The first thing [Republicans] will say the morning after the election is we are dedicated to the re-election of Donald Trump. And that becomes the overriding goal." They will need to defend the president against a swift shift by the Democrats to investigate many corners of the administration. Any political damage inflicted on Trump's re-election efforts will also affect GOP candidates in 2020. NPR's congressional reporter Kelsey Snell contributed to this report.